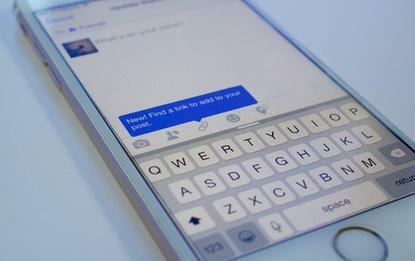 Facebook's link sharing button, on an iPhone 6 on June 25, 2015. Sharing links with friends in Facebook's mobile app is a pain that requires - gasp - leaving Facebook and copying and pasting URLs. Now there's a feature that simplifies the process. Facebook has added a new button in its iOS app that appears when you're composing a status update. It appears as a link icon in the lower bar. Tap it, and you'll be able to search for videos, articles and other links that have previously been shared on Facebook. The feature, called "add a link," will let you view the articles and embed one in your status update with a single tap. It's not clear how many links are in Facebook's database, but they're culled from the company's index of roughly one trillion posts, wrote Facebook engineering manager Tom Whitnah. "Add a link" came from an idea that was developed during a Facebook hackathon, an event in which engineers and other employees create products and tools outside of their usual work. The link-sharing feature is currently available in Facebook's iOS app in the U.S. A version for Android and Facebook Messenger is in the works, Whitnah wrote. The timing is perfect as Facebook begins a new effort to publish outside media companies' articles directly in the News Feed, starting on iOS. The link-sharing feature could help users to spread this content around, keeping users active on Facebook. Facebook is also trying to more broadly index the variety of content posted to its site. Some of its work here has led to other new features, like the ability to search for past posts.